This access statement does not contain personal opinions as to our suitability for those with disabilities, but aims to accurately describe the facilities and services that we offer all of our guests. This statement is reviewed regularly and updated when appropriate. You can download a printable PDF of this Access Statement. 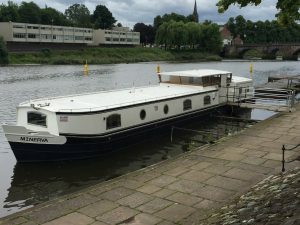 ChesterBoat is Cheshire’s largest river cruise operator. We have a range of trips to suit everyone, including daytime sightseeing cruises, evening cruises, package cruises, party cruises and much more. 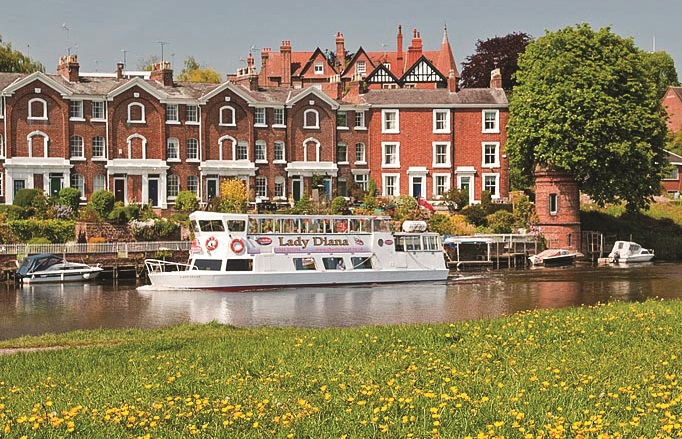 Join us to escape the hustle and bustle of the City and relax on a cruise along the River Dee in Chester. To discover more about us and the services we offer please visit our website or call 01244 325394 for more details. For full details and maps of how to reach us please see the “How to Get Here” section of our website. In both cases simply enter our postcode CH1 1SD as your destination but please note that the street address that you need is Souters Lane and not Dee Lane. Transport for Wales – direct trains into Chester, operating services between Wales and Manchester. 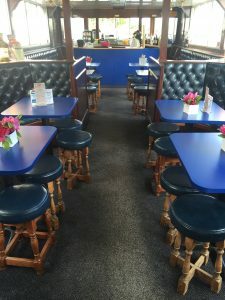 Cross Country Trains – services to Crewe from Scotland, East and South West England with connections from other providers then to Chester. East Midlands Trains – services to Crewe and Manchester from the Midlands and London with connections from other providers then to Chester. First Trans Pennine Express – services to Manchester from the the North East and East Coast with connections from other providers then to Chester. London Midland Trains – services to Crewe and Liverpool from London and the Midlands with connections from other providers then to Chester. Merseyrail – direct trains into Chester from Liverpool and the surrounding area. Northern Rail – services to Manchester from across the North of England with direct connections into Chester from Manchester Piccadilly. Virgin Trains – services into Crewe from London and the North West with direct connections into Chester from Northern Rail and Transport for Wales. Also offer some direct services into Chester. There are a number of major roads including the M53, M56, M6 and A483 that provide excellent links to Chester from North Wales, Liverpool, Manchester and the south of England. Our moorings are signposted from some of these roads and in the city centre. Follow the brown road signs for “River trips”. If you are driving to our moorings, please note that our postcode has now been changed from CH1 1SD to CH1 1SZ. For all postal correspondence, please use CH1 1SZ. Royal Mail have informed us that it can take time for internet databases to update their post code data and so if you are using Google Maps or a Sat Nav to try to find us, try using CH1 1SZ first but if this doesn’t work or register, then please use CH1 1SD but note that we are on Souters Lane and not Dee Lane. These two lanes previously shared the post code CH1 1SD and there is no vehicular access between them. CH1 1SD will still register for Souters Lane until the online databases are updated with our new post code. 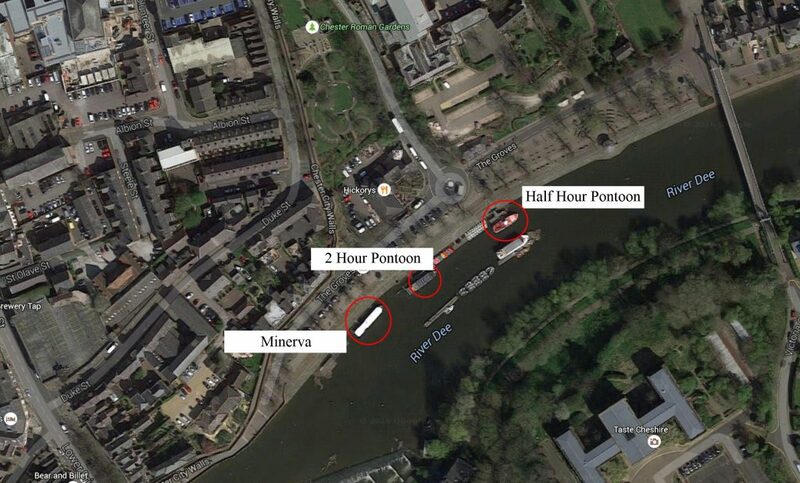 Please note that if you are driving to our moorings, you can only park at the Groves for one hour for free. This is a free public parking area and we cannot guarantee availability of spaces. 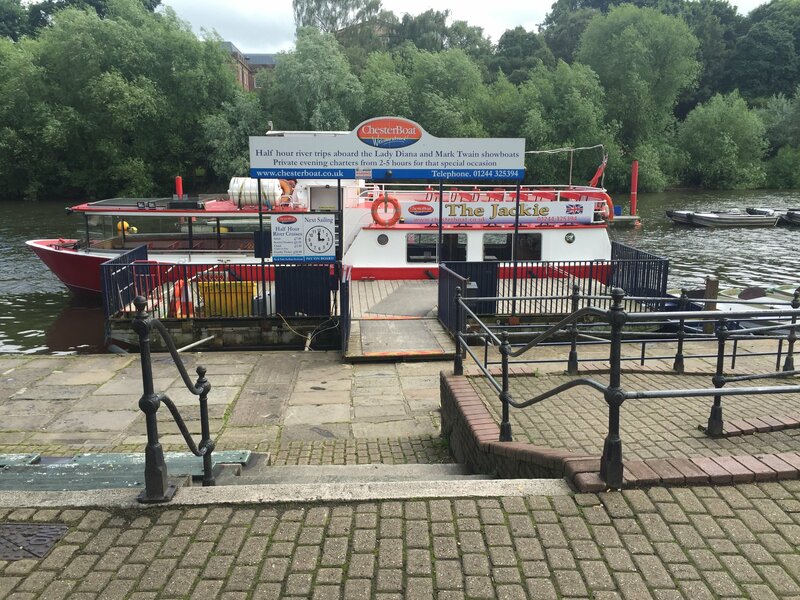 There are also disabled parking spaces with a maximum stay of two hours next to our moorings. NCP Pepper Street Car Park, Pepper St, Chester, CH1 1DF. Little Roodee Coach & Car Park. Grosvenor Rd, Chester, CH1 1SL. For a full list of Chester Car Parks, please click here. 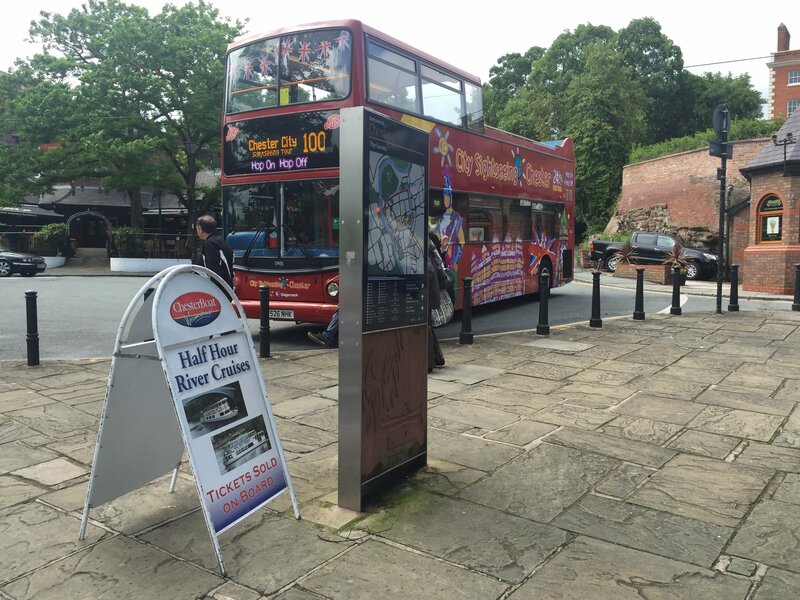 For more information about the Park and Ride service in Chester, please click here. City Sightseeing open top bus disembarking passengers adjacent to our Half Hour City cruise pontoon access steps and paved wheelchair slope. 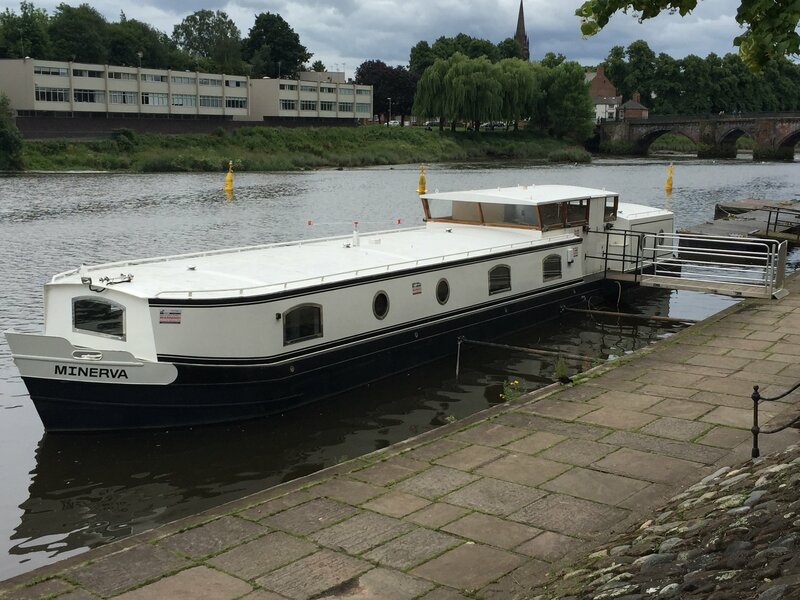 Our customer office is the cream and black barge, Minerva, permanently moored on the river Dee at Souters Lane, opposite Hickory’s Smokehouse. 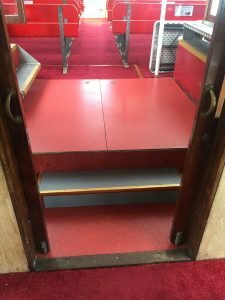 Access to Minerva is via a wheelchair-accessible ramp measuring 86 cm wide and then a double doorway measuring 88cm wide. 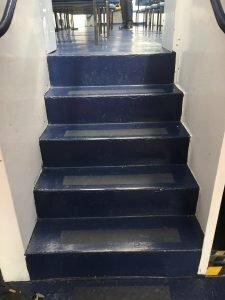 There are four steps down into the main sales area but the sales team will happily meet customers in the main entrance office area should you have difficulty with these stairs. The office is open to customers from 9am to 5pm, Monday to Friday all year round. The only exception is during a two week shutdown for the Christmas holidays, details of which can be found here. 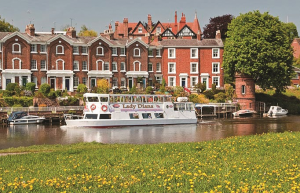 All of our cruises depart from the moorings at Souters Lane, the Groves, Chester, CH1 1SD. 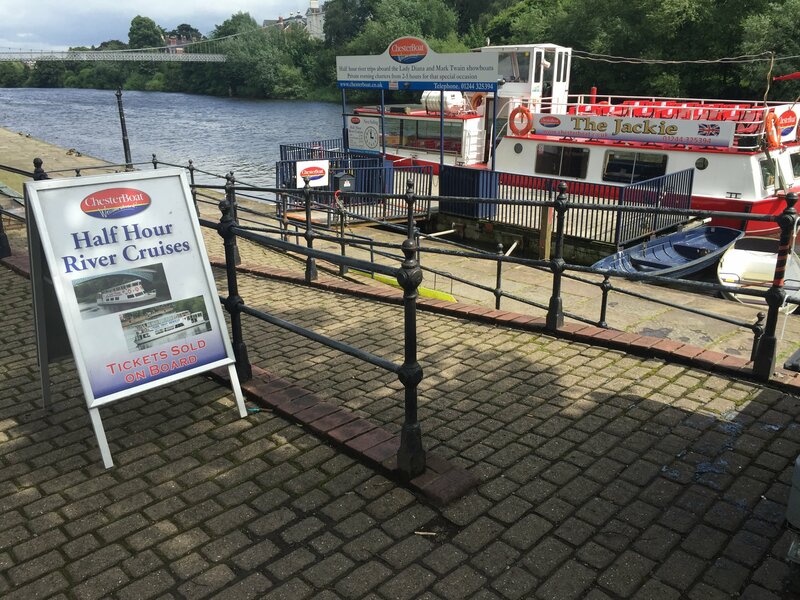 Our moorings at the Groves are close to and within walking distance of the Roman Amphitheater, the Roodee Racecourse, the Grosvenor Museum, Deva Roman Experience, Chester Cathedral, the Visitor Information Centre, Grosvenor Park, Chester roman Gardens and Chester Railway Station. At the Groves we have two floating pontoons with wooden decking and steel handrails. 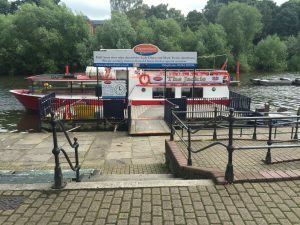 The first pontoon, directly opposite Hickory’s Smokehouse, provides access to the vessels operating our Half Hour City cruises. It is accessible to wheelchair users and is accessed via a ramp with hand rails on either side. The angle of the ramp will vary with river height but should not exceed 12 degrees. 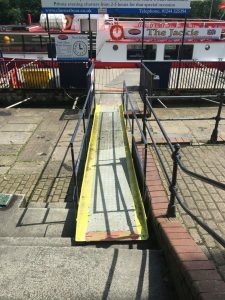 The ramp is 167cm wide and has a 10cm lip when you first access it from the riverside path. Half Hour City Cruise pontoon, viewed from the top of the steps. 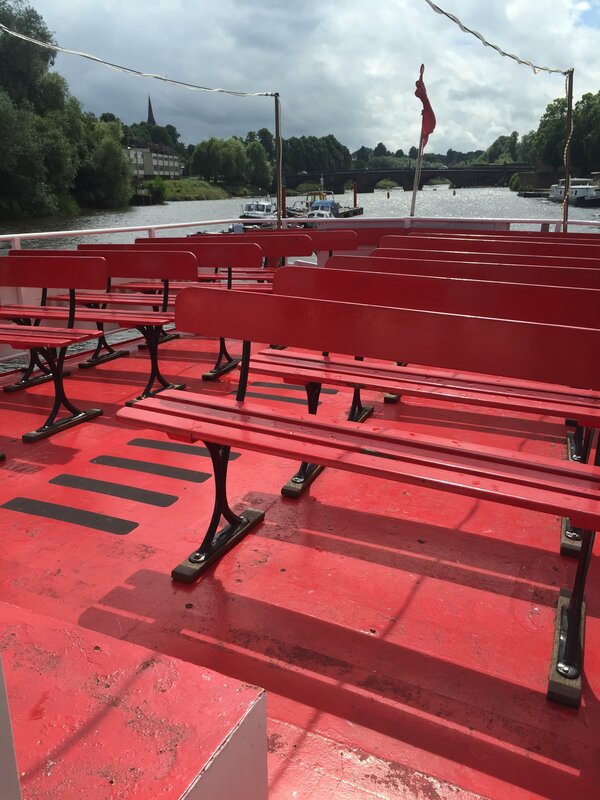 The second pontoon, closer to our office barge Minerva, provides access to the vessel operating our 2 Hour Iron Bridge cruises. Again, it is accessible to wheelchair users and is accessed via a ramp with hand rails on either side. The angle of the ramp will vary with river height but should not exceed 12 degrees. 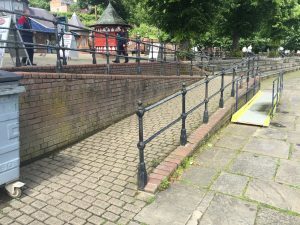 The ramp is 112cm wide and sits level with the riverside path. 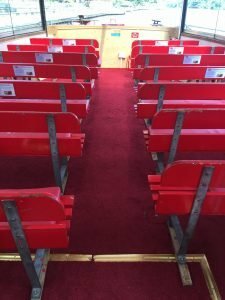 2 Hour Cruise pontoon, viewed from the top of the steps. 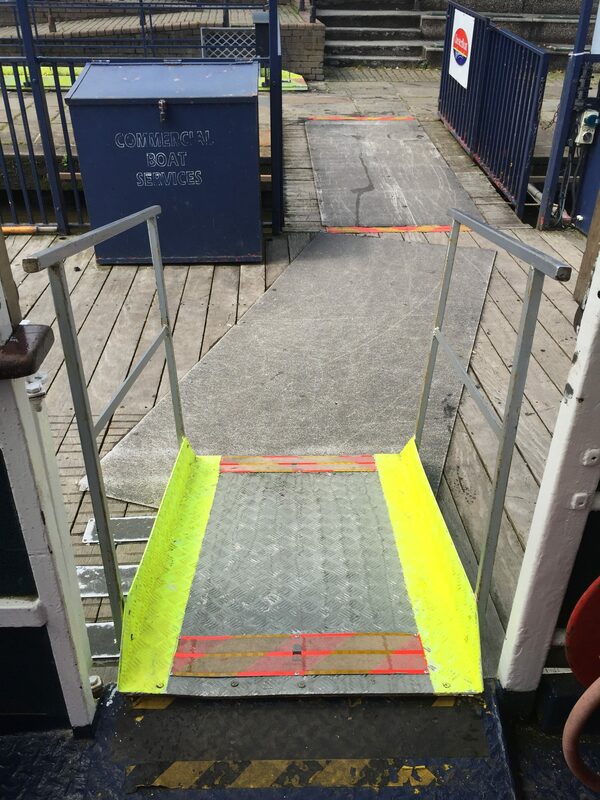 Both of the pontoons can be reached via the paved slope adjacent to the steps leading to our Half Hour landing stage. 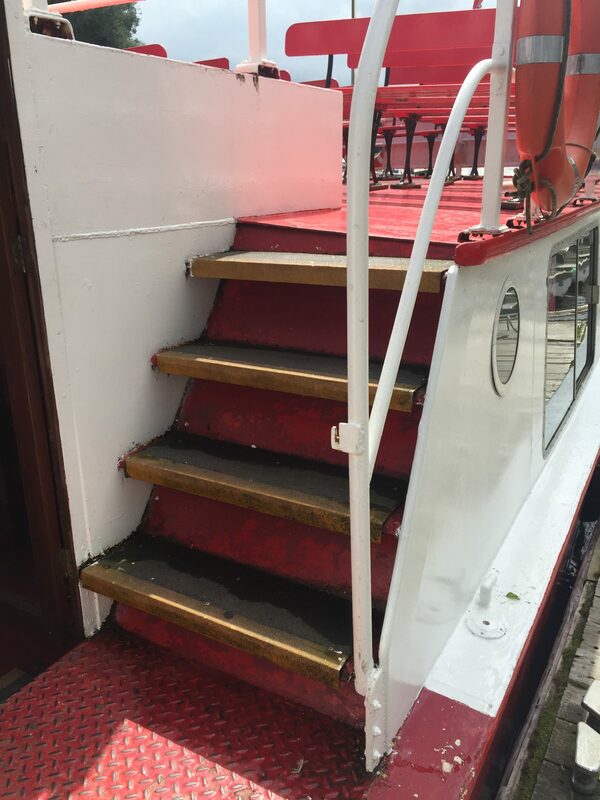 Alternatively, there are steps with handrails leading down to both of our pontoons. Paved slope down to our pontoons, viewed from the road level. Paved slope down to our pontoons, viewed from the riverside path. Occasionally, when the tide pushes the river Dee above the weir close to our moorings, the river rises above the riverside path at the Groves. 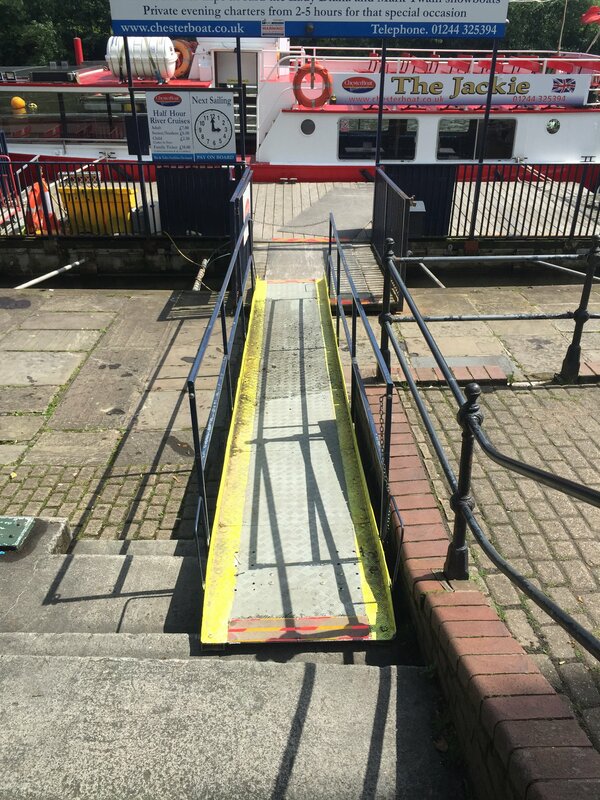 On these occasions, we have a temporary ramp which will span from the steps to our Half Hour City cruise pontoon or alternatively from the paved slope adjacent to them. 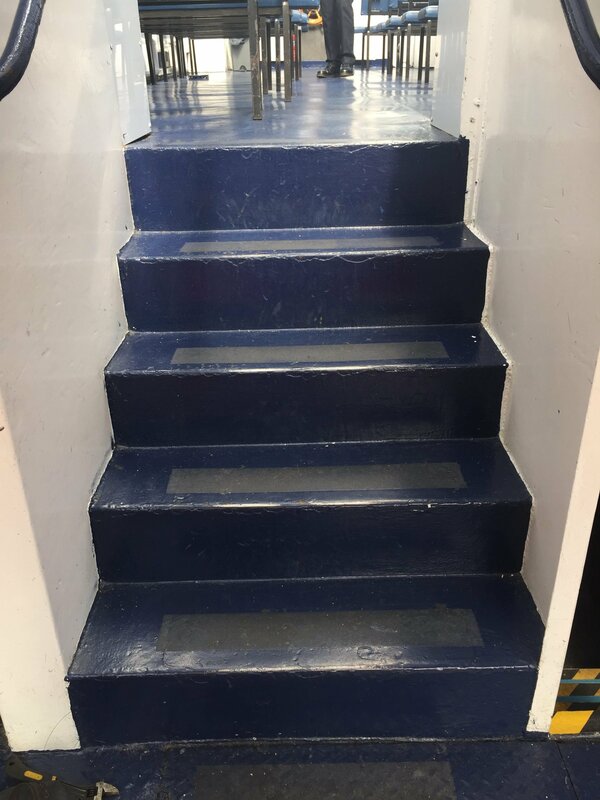 This ramp is 76cm wide. 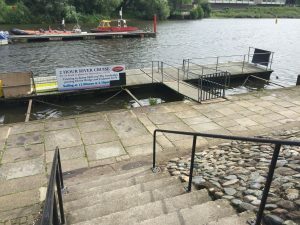 ChesterBoat tide access ramp for Half Hour cruise pontoon, viewed from riverside path. 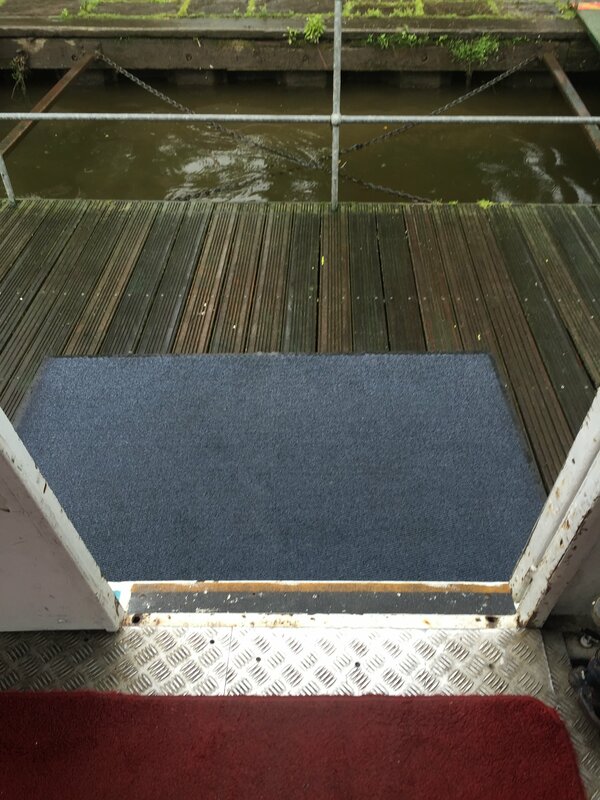 ChesterBoat tide access ramp for Half Hour cruise pontoon, viewed from above. 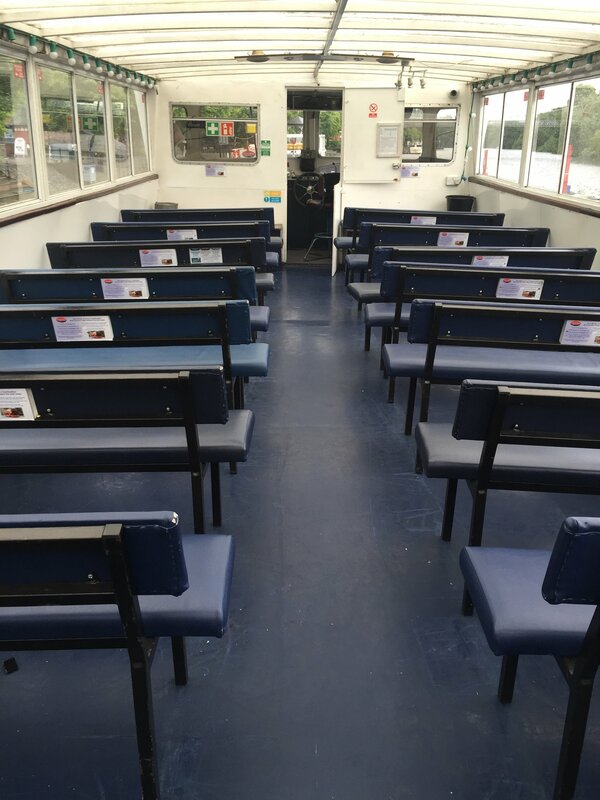 On these occasions, all cruises will depart from our Half Hour City cruise pontoon. Please note, on these occasions some sailings may depart and return later than advertised. 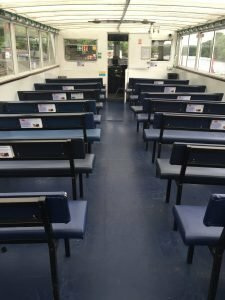 There will always be a member of staff available to offer assistance on board for any of our cruises, should this be required. The landings have been designed so that there will be the smallest possible step up or down from the landing stage to the vessels boarding point. Because the landing stages float, any step onto the boat will remain constant with river height. As passengers embark or disembark the boat will fall or rise slightly relative to the landing and this may result in a small step up or down when boarding the boat. 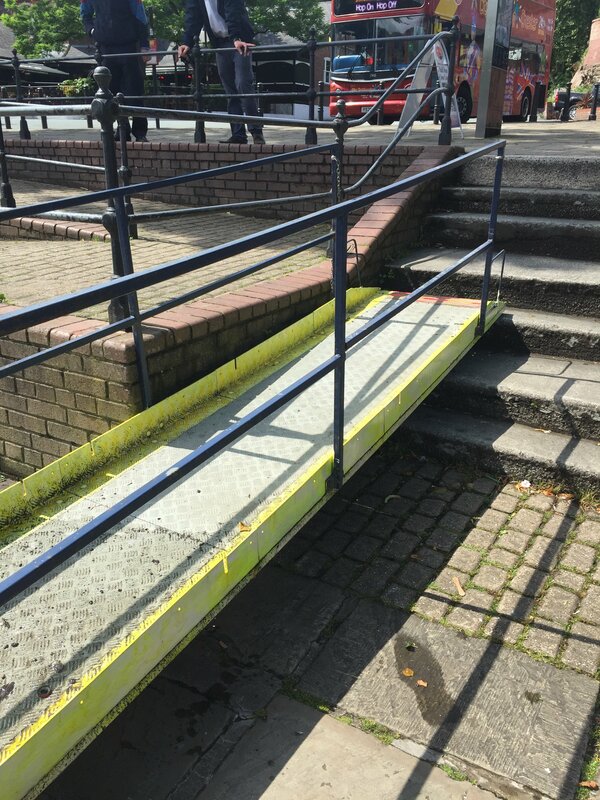 Temporary wheelchair access ramps with handrails can be utilised on either of these moorings. Two of our fleet (Lady Diana and Mark Twain) are compatible with these ramps and so are classified as wheelchair-accessible. 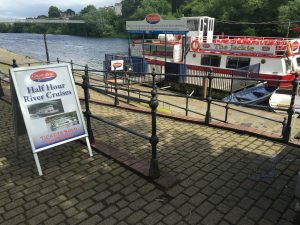 One of these two vessels will always operate our 2 Hour Iron Bridge cruises whilst the other would then be operating our Half Hour City cruises. 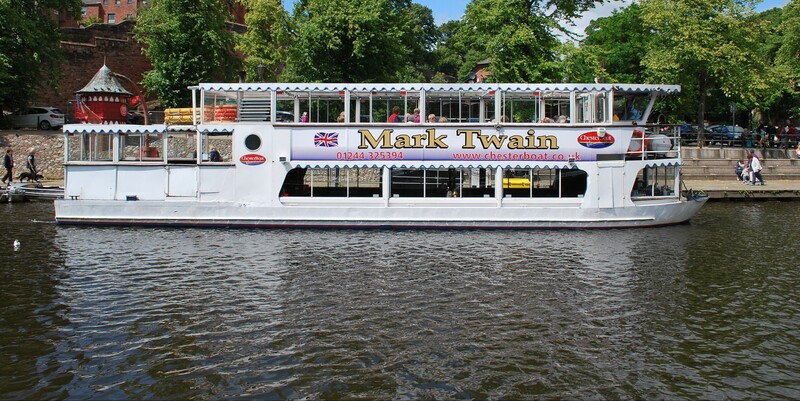 Consequently, wheelchair users have a choice of joining either of our daytime sightseeing cruises. The temporary wheelchair access ramps on both of our pontoons are 77cm wide at the narrowest point and the boarding gates of the Lady Diana and Mark Twain are wider than the ramp. 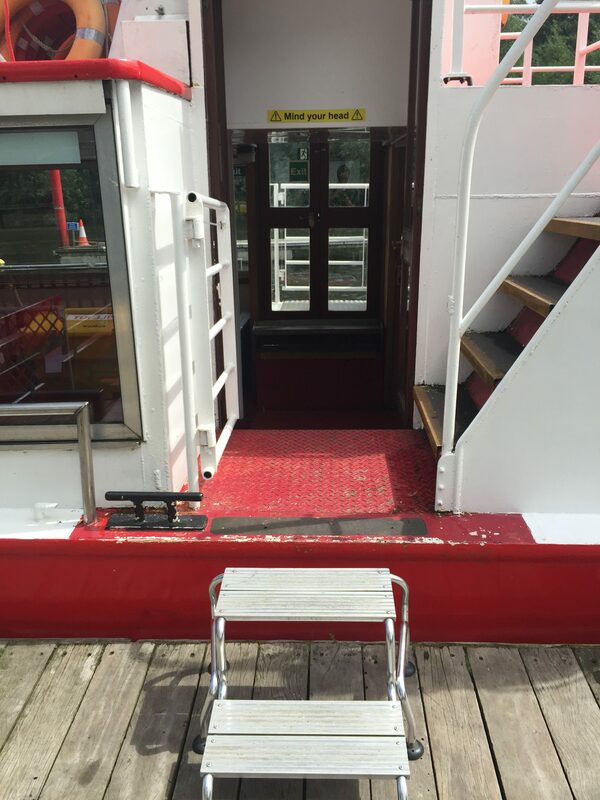 So the maximum width wheelchair that could access either of these vessels is 76cm. In both instances, this would give access to the rear mid-level deck. 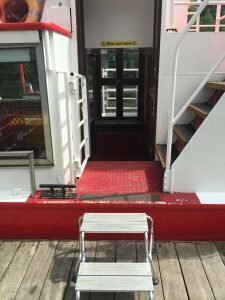 ChesterBoat temporary wheelchair access ramp viewed from the Half Hour City cruise pontoon. Attached to the Mark Twain boarding gate. 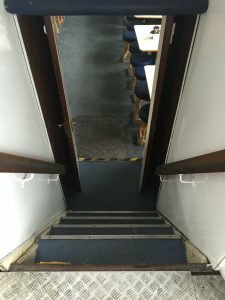 Our third vessel, the Jackie, has stairs leading in either direction from the boarding gate and so is not wheelchair accessible. 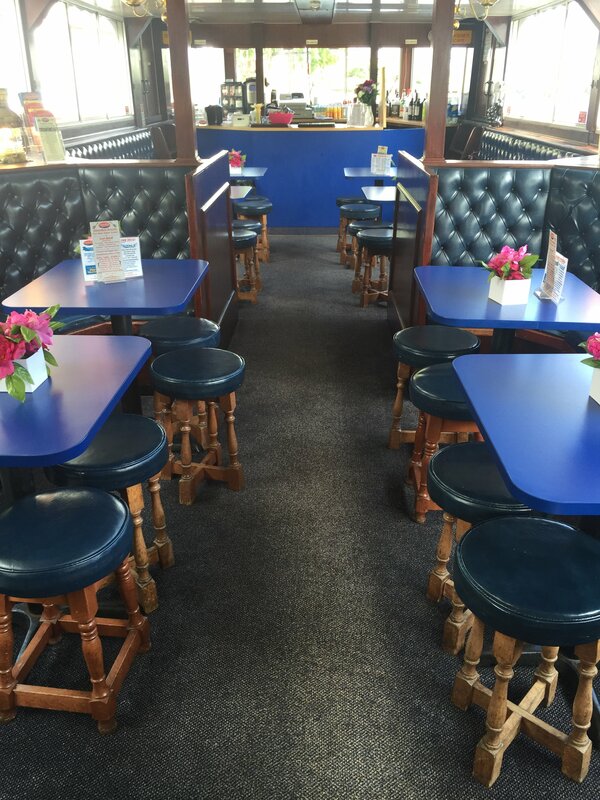 The Jackie would always be one of two vessels operating the Half Hour City cruises. 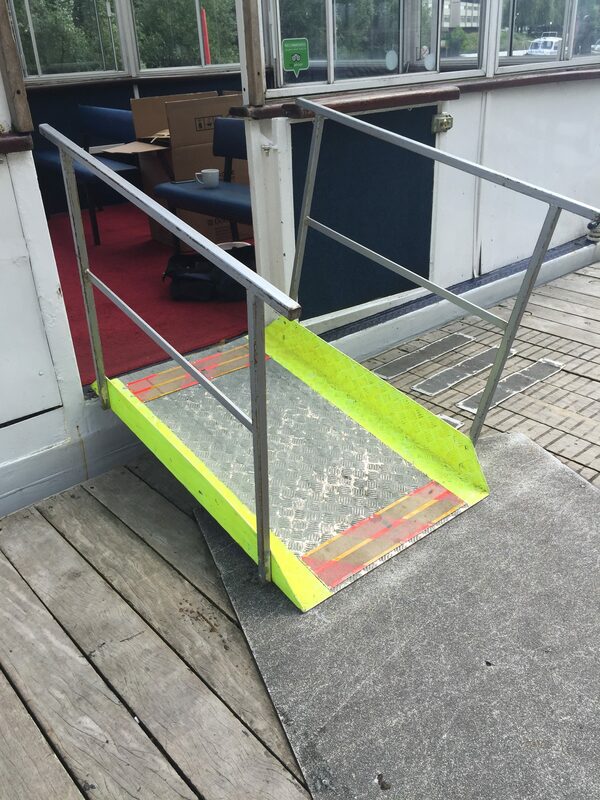 Any passengers who would require the use of a ramp to board the vessel for a Half Hour City cruise would be advised to call our office on the day of sailing to enquire as to the sailing schedule of the wheelchair-accessible vessels. Our office phone number is 01244 325394. On weekends when the office is closed, this telephone number redirects to a mobile phone which will be answered by the duty manager who will be able to advise of this schedule. It is not possible to accommodate mobility scooters on board but they may be left on the landing stage at the Groves during the cruise. ChesterBoat operates a fleet of three passenger boats. 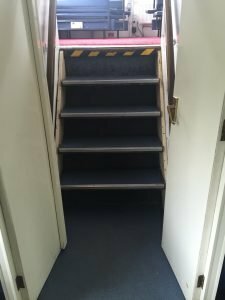 Each has a different layout and some are more suitable for wheelchair users and those with restricted mobility than others. 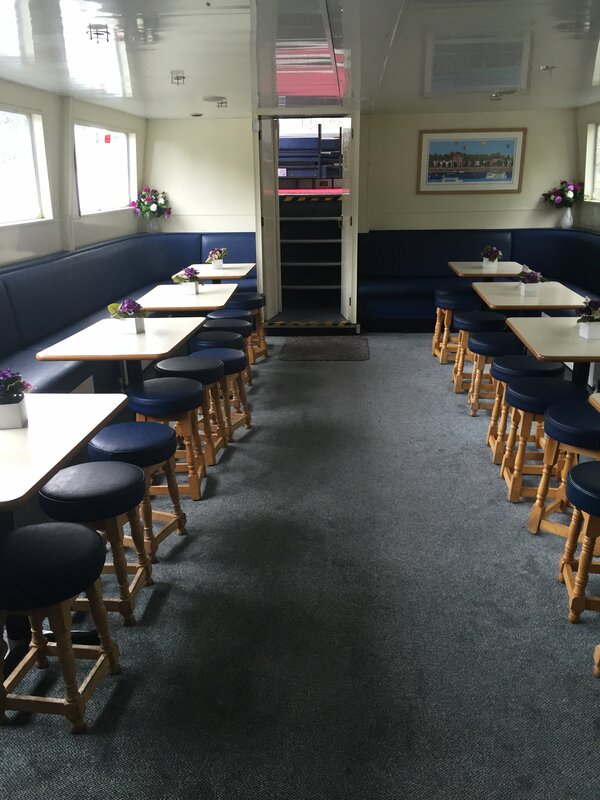 Each has an enclosed heated saloon on the lower deck and an upper deck. 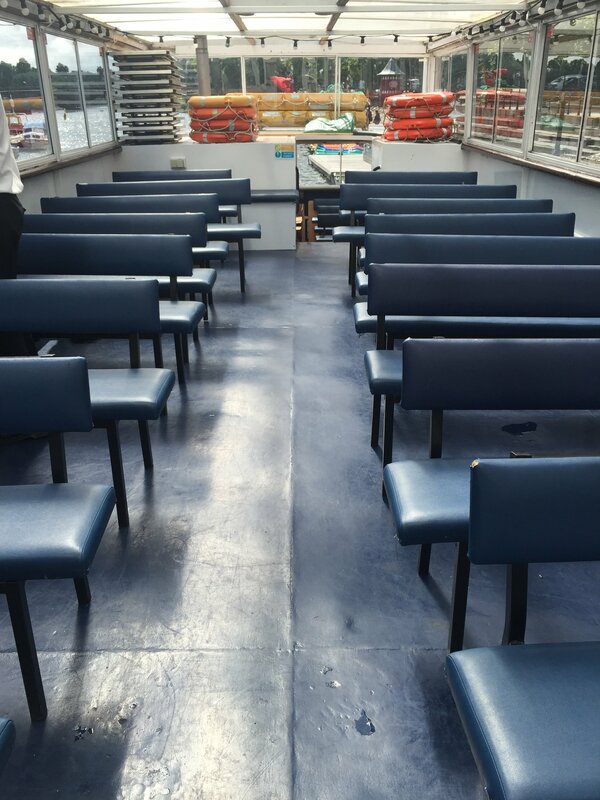 Furniture on both decks may be able to be rearranged to accommodate wheelchairs. Unfortunately, due to the design of our boats, access to the upper decks can be difficult for those with restricted mobility and may not be possible for wheelchair users. 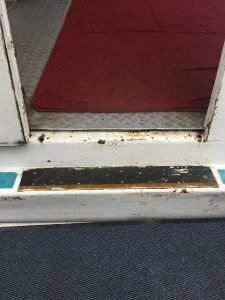 Unfortunately, none of our fleet have wheelchair accessible toilets. 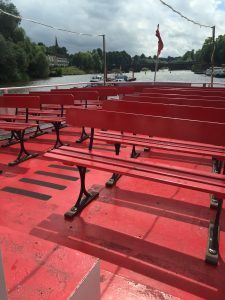 All boats have an amplified public address system with speakers located on the open and enclosed decks. Due to the location of the speakers the volume will vary slightly around the vessel. Those with a hearing impairment may find it useful to ask a crew member where best to sit to enjoy the commentary. All passengers are encouraged to request that the volume is increased if they are having difficulty hearing the commentary clearly. 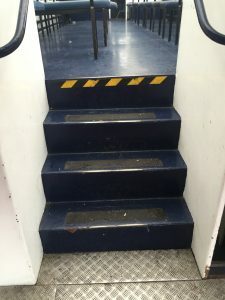 All crew members are aware that we welcome all people on board and that some may have a mental or physical illness or disability, dementia or a learning disability including autistic spectrum disorder that means that they may need some extra assistance or understanding to fully enjoying their cruise. 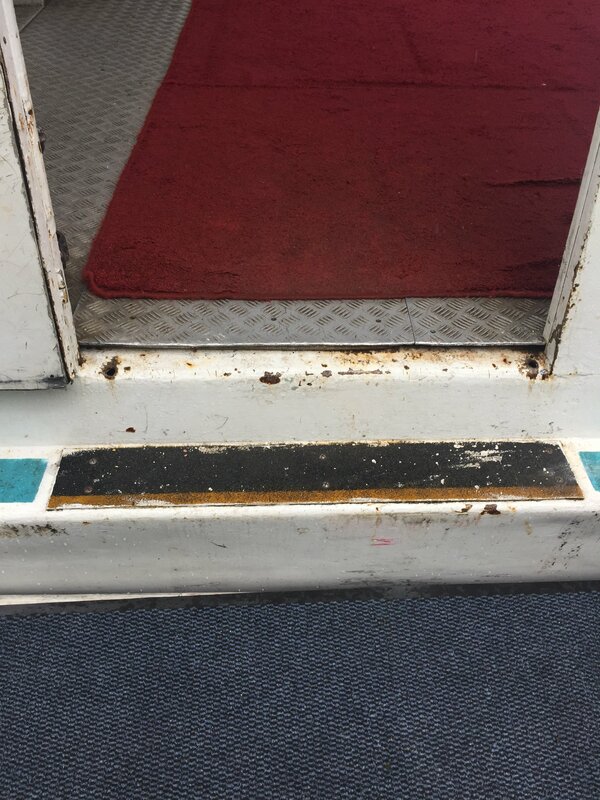 Lady Diana boarding gate without wheelchair access ramp attached. 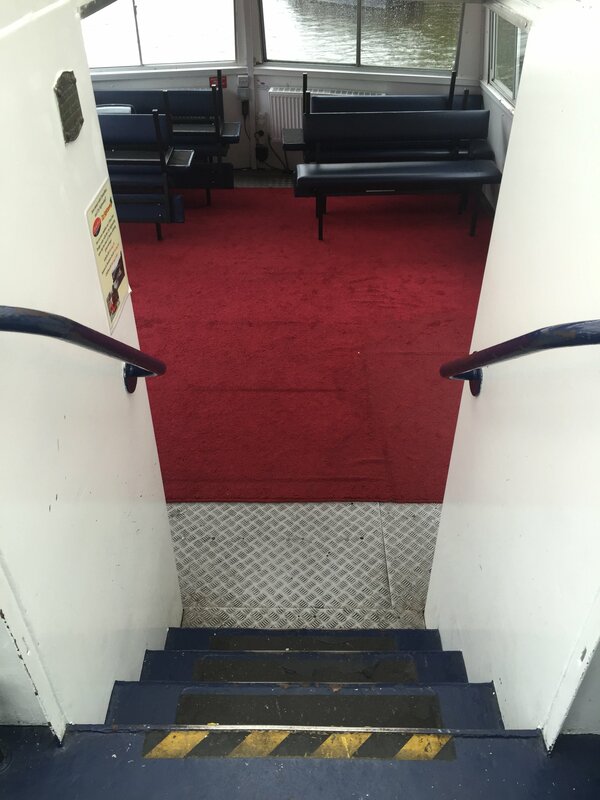 Lady Diana boarding gate viewed from inside the rear mid-level deck. Lady Diana upper deck access stairs with handrail either side viewed from rear mid-level deck. Lady Diana upper deck access stairs with handrail either side viewed from upper deck. Lady Diana lower saloon access stairs with handrail either side viewed from rear mid-level deck. Lady Diana lower saloon access stairs with handrail either side viewed from the saloon. Mark Twain boarding gate with temporary wheelchair access ramp attached. 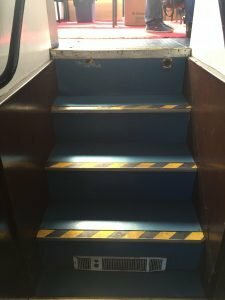 Mark Twain upper deck access stairs with handrail either side. Mark Twain lower deck access stairs with handrail either side, viewed from lower deck. Mark Twain lower deck access stairs with handrail either side, viewed from rear mid-level deck. 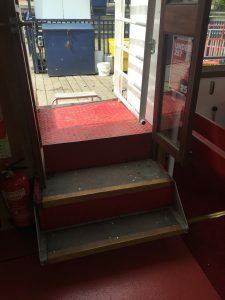 The Jackie is unfortunately not compatible with our temporary wheelchair accessible ramp and has steps leading in both directions from the boarding gate, so the boat is not suitable for wheelchairs and also those with pushchairs. There are two temporary aluminium steps to board the Jackie. 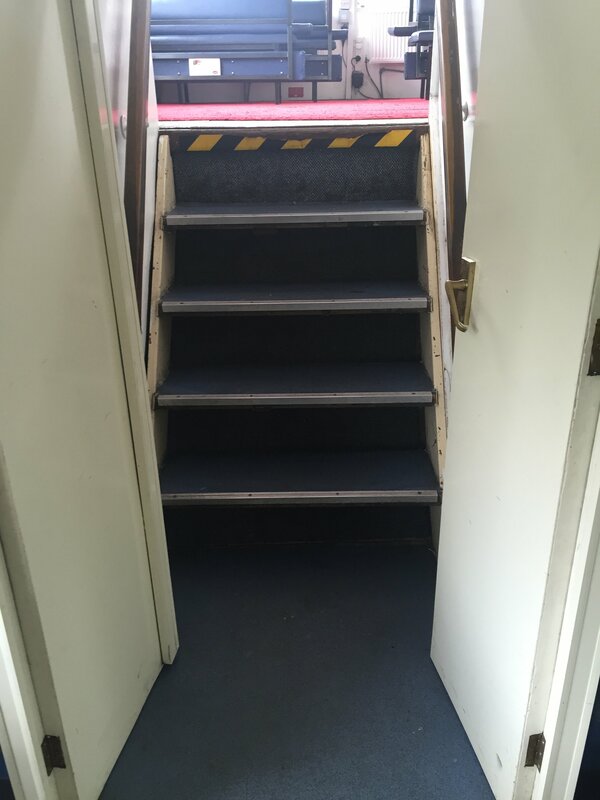 Jackie boarding gate with temporary aluminium steps. Jackie upper deck steps with handrail on right hand side if travelling upstairs. 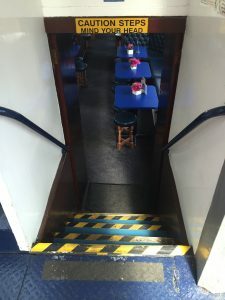 The Jackie lower deck steps viewed from inside. 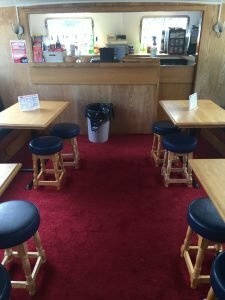 The Jackie lower rear saloon. The Jackie lower rear saloon steps to right of main boarding area. 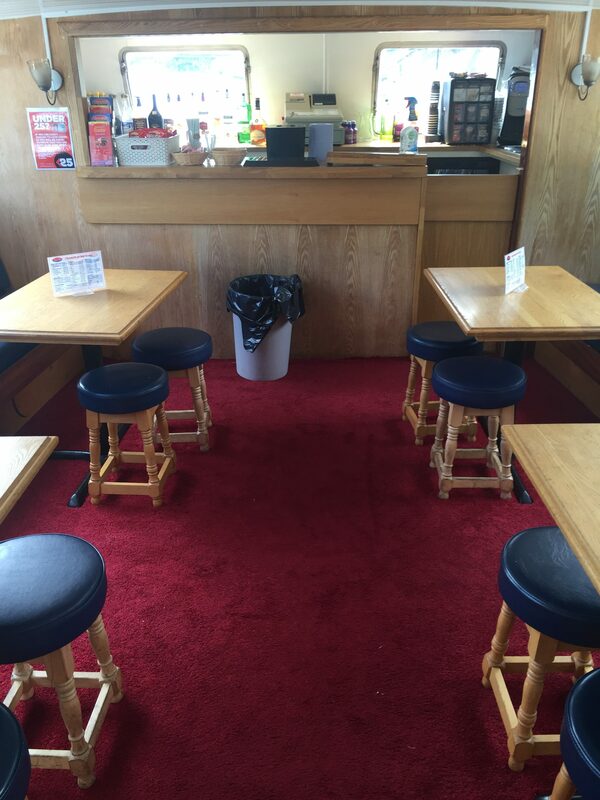 The Jackie lower forward saloon. To read our Policy Relating to Fares for Disabled Passengers and Carers, please click here.